We Inspire, Design, Develop and Refine Websites, Web Applications, Blogs, Content Management Solutions, Social Media Mash Ups and Internet Marketing Strategies for SF Bay Area small businesses. DesireMint.com producers recruit the most talented and specialized designers and developers for our clients to build amazing Internet tools and services. This gives our clients the assured hand of experienced web design and project management along with fresh and creative talent. Andrew Seybold is a well known and respected wireless industry consultant. We redesigned his site, set him up with a full WordPress/CMS solution, archived hundreds of old posts from his old site and redesigned his eMail campaigns for his 7,000 subscribers. Mr Seybold's team has full control over creating and managing content and the Homepage dynamically updates with upcoming events, testimonials, blog posts, newsletters and graphic features. We created this site for a cute little dress shop in Alameda. They are able to easily update the site themselves with new pictures of the dresses they have in store. The site caught the eye of a National Geographic producer and on Dec 14th the store was closed for a photoshoot to be featured in an upcoming story on American culture. We designed and coded a a fresh new look for this company in June. They needed to improve their SEO and find a way to feature upcoming events and announcements on their HP. Our UI solution was responsible for helping them sign up more than 2,000+ paid attendees for a single webinar in just a few days. They had to stop accepting attendees due to technical limitations of their conferencing software! 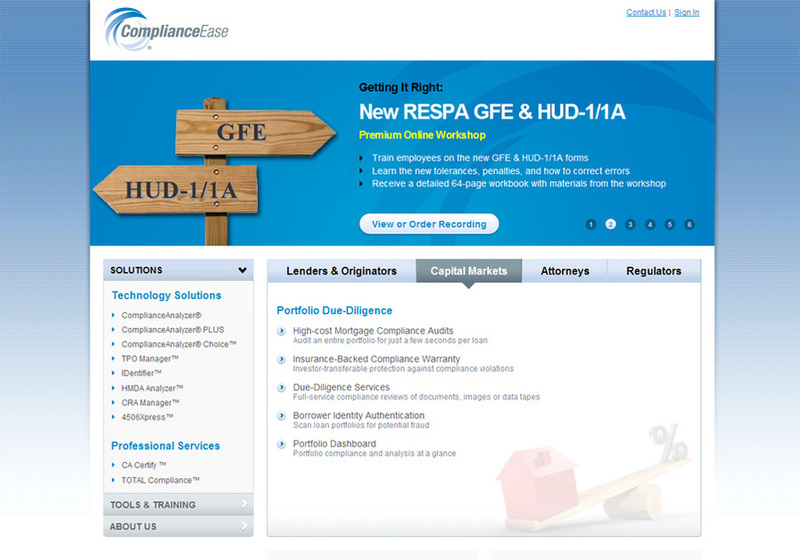 This Mortgage compliance software company hired us to Redesign their homepage to improve search Engine Optimization.